The DeKalb County School District has been placed on probation by its accrediting agency. The Southern Association of Colleges and Schools (SACS) announced the sanction Monday after wrapping up a six-month investigation. 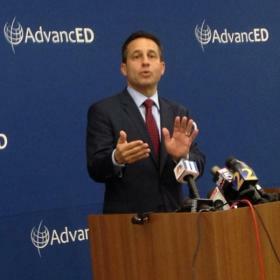 The DeKalb Schools’ accreditation was already “on advisement,” mainly due to governance problems. Now, Mark Elgart, the CEO of SACS’ parent company, says the condition of the district is one of “conflict and chaos,” mainly because board members interfered with day-to-day operations of the school system. Elgart went on to say the board knowingly under-budgeted for legal expenses and utilities year after year. He said the board struggled to manage the district’s $1 billion annual budget. For example, Elgart said, the board took out a $25 million loan to buy textbooks. But SACS couldn’t find any evidence the money was actually used to buy books. The district will be on probation for one year. SACS has given the board four Required Actions to complete during that time period. Elgart says if the board doesn’t do so, a loss of accreditation is “imminent.” And, Elgart says, the board will face further scrutiny. “Because the system is placed on probation for governance issues, by state law, they must go before the state board of education within 30 days for a hearing,” Elgart explains. That process will begin in January. The state board has the authority to recommend to the governor whether board members should be removed.